You would think that nomenclature is something pretty obvious and objective derived from and built on top of the scientific discoveries of the relationships of taxa. Furthermore you would expect that scientists have some sort of consistency in this conduct. Let's see how this applies to two recent studies by Phil Ward, Sean Brady, Ted Schultz and Brian Fisher on army ants and myrmicine ants. Tetramorium = Rhoptromyrmex syn.n.=Anergates syn.n. 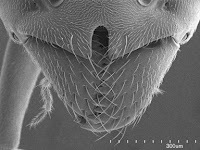 = Teleutomyrmex syn.n. Protomognathus is not included in the current phylogeny, but because of some mtDNA based evidence included in the synonymy. At the same time, the sister clade including Leptothorax, no synonymy has been proposed. Tetramorium includes now some of it social parasites Anergates and Teleutomyrmex that are listed in the IUCN RedList (eg Anergates, Teleutomyrmex) but not Strongylognathus. This will add to an additional confusion outside the taxonomic world. The reason for omitting Strongylognathus from synonymy is the older name than Tetramorium and thus all the Tetramoriums would have changed - this then is too much for the authors. So they stop here by mentioning to get to the ICZN to solve the problem later. This somewhat arbitraty behavior is even more obvious. The same authors don't follow with their practice to clean up obvious historical artifacts in their work on dorylines. It is obvious, that all the doryline genera ought to be synonymized with Cerapachys (or the oldest available name), or then many old suppressed generic names would have to be revived (what the indirectly do in their figure, but not explictely in the text), and thus exactly the opposite of their lumping in the myrmicines. But nothing has been done. If the phylogenetic analyses are that strong (why this might not be the case will be discussed in a follow up blog), why not have more genera, that in many ways can be diagnosed with behavioral or morphological traits (in some cases even apomorphies) rather than have increasingly huge taxa in which informal species groups will be defined? The worst being the formicoid clade that is entirely based on molecular analysis. The advantage of diagnosable groups is obvious, and the handling of taxonomic information is simple with the current IT infrastructure where we can link all names to the respective database in place. If there is such a strong believe in molecular data and analysis - because it is based on sound scientific analytical tools - why not be as strict in inferring the respective nomenclaturial changes? In the present case, this objectivity is definitely missing or not obvious. This is the blog companion for antbase.org- on ants (Hymenoptera: Formicidae), zoological nomenclature, taxonomy, systematics, phylogeny, comparative biology and cybertaxonomy.